Remember that compliments may sound awkward in the beginning. They get better with practice. You will create a positive atmosphere in your family when everyone learns to look for the good in each other and to verbalize positive comments. Please don’t expect perfection. Some sibling squabbling is normal. 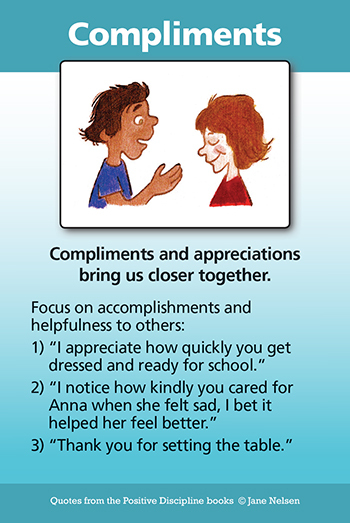 However, when children (and parents) learn to give and receive compliments, negative tension is reduced considerably. Of course, a positive atmosphere is increased even more when families have regular family meetings to find solutions to problems. I have the privilege of working with a positive, energetic, and brilliant group of people. I have had the best time this year.